Not to be Mister-Anti but I actually liked this comic book. It moved several characters with distinctive worldviews through one day that ended with somebody getting his neck broken by accident. The flat-note ending was pitch-perfect for me and I like that the ending’s implication is…implied by the way Rogue looks up to see the press cameras all directed at her. Not a word is needed after that moment and not a word is offered. That is the end of the story, CRACK, neck broken. 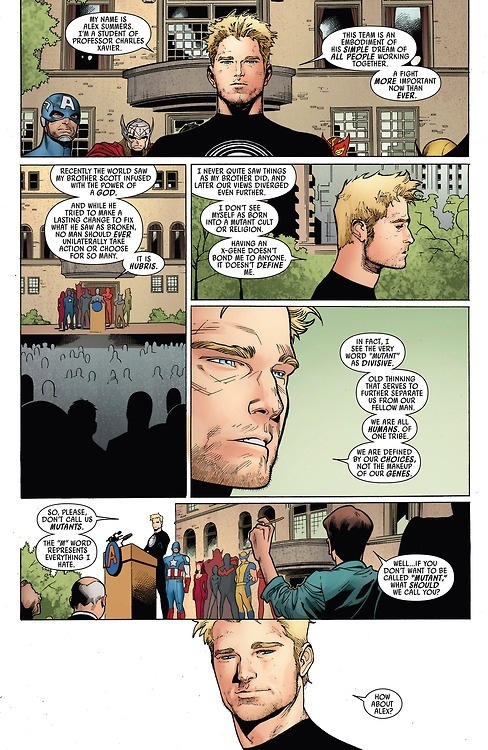 But let’s be reality, the reason people care about this particular comic is a scene that happens earlier. Alex, a character who is indicated by the story to be the leader of this group of characters, delivers a press conference where he says something so silly that I’ve never heard it before in real life. “Mutant” in comic storyland isn’t a slur in and of itself. It’s a group descriptor like “gay,” “black,” “Muslim.” A slur would be a crude term of division which shouldn’t be spoken in polite company (taking its cue from “the ‘N’word” of real life). The slur would be a term of undisputed hostility and derision (ie, “gene-joke,” “mutie,” “freak”), not the term which merely describes the group of people. Now, Alex could be a “self-hating mutant,” I suppose. Particularly to contrast with his brother Scott, who is concurrently raising a mutant revolution army in some other comic book. Scott the separatist and Alex the assimilationist. That could work as a believable tension. But it still doesn’t work in the particular language twist that this scene tries to achieve. This scene doesn’t achieve its goal of paralleling real-world expressions of oppressed people (which the mutants are meant to represent). Not a problem, I live in Greenpoint. This comic makes a try at tackling a real-world issue. It misfires. That’s okay, try again.